I was hanging out with Allen in Brecksville when a friend walked in with a new album that we had to hear. “It’s just the normal noises in here.” This was my second bite at discovering rock and roll and it was the greatest thing that I had ever heard in my life. Tom Petty and the Heartbreakers came to Cleveland a few months later. Somehow, we bought tickets for the concert, which seemed like a huge outlay. This would be my first big rock concert. In the brief time between acquiring the tickets and going to the concert, I got into some trouble and could not go. I spent the evening in agony and dismay. 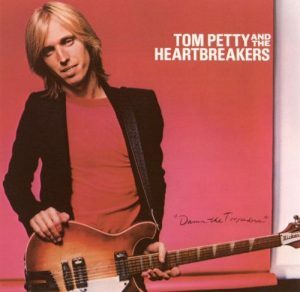 I never did make it to a Tom Petty concert, but it always seemed like something that we ought to plan. I made the list of artists over a year ago. It has evolved over time, but most of the subjects have been identified for a long time. None of them were supposed to move from the present tense into the past tense while I was waiting to write about them. I write these far enough in advance that this is the morning after Petty died. That means that it is also two days after the horror in Las Vegas, perpetrated at a concert. My reaction as a youth to missing Tom Petty was definitely overwrought. Since then, I should have taken advantage of the many opportunities to see him in concert. I can’t justify not going out of my way, when I have so many other times. Perhaps I just assumed that Tom Petty would magically appear in my living room and offer to perform for me for free as long as there was beer in the fridge. Now, all I can do is look back at all those missed opportunities with regret. I’ll never get to hear his voice in person. I can live with that because of all his magnificent recordings though I doubt his friends and family have such a direct path to peace. I can resolve to push myself a bit more to experience life and get off my backside. Realistically, that’s pretty easy compared to moving a nation toward sanity and peace. You’ve Got to Check This Out is a blog series about music, words, and all sorts of artistic matters. It started with an explanation. 62 more to go.